Paralysed Japanese man takes a walk in Second Life. A paralysed man using only his brain waves has been able to manipulate a virtual Internet character, Japanese researchers said Monday, calling it a world first. The 41-year-old patient used his imagination to make his character take a walk and chat to another virtual person on the popular Second Life website. The patient, who has suffered paralysis for more than 30 years, can barely bend his fingers due to a progressive muscle disease so cannot use a mouse or keyboard in the traditional way. In the experiment, he wore headgear with three electrodes monitoring brain waves related to his hands and legs. Even though he cannot move his legs, he imagined that his character was walking. He was then able to have a conversation with the other character using an attached microphone, said the researchers at Japan’s Keio University. This is very amazing news, and something many people have hoped that virtual worlds could be used for. I wonder if the man feels like he has gained some freedom back. Mitch Kapor and Philippe Bossut from Kapor Enterprises designed a interface prototype that makes it possible to operate Second Life with out a mouse or keyboard, and called it Hands Free 3D. It is pretty good what they already got done, but one does wonder how comfortable it is to navigate this way, it might be fun for a presentation, but I’m skeptical if this really is a superior control system. Besides they don’t show a example of building, which I’m more interested in. I can envision something where you pick up prims and mod them with your hands. They mention that 3D cameras aren’t available for the mainstream yet, but I would think a larger screen or a beamer would be needed to, to better see where you are. It is a cool development, and it is only the first phase. Now we have to figure out how this could be best used. The Daily Show has a short piece about the congress hearing on the Virtual Worlds. Of course all the old old old jokes about virtual worlds and the Second Life name come by. Disappointingly they didn’t actually used Second Life for the in world reporter bit. The International Justice Center, a virtual clearinghouse for public education and action in support of the International Criminal Court (ICC) and related human rights concerns. 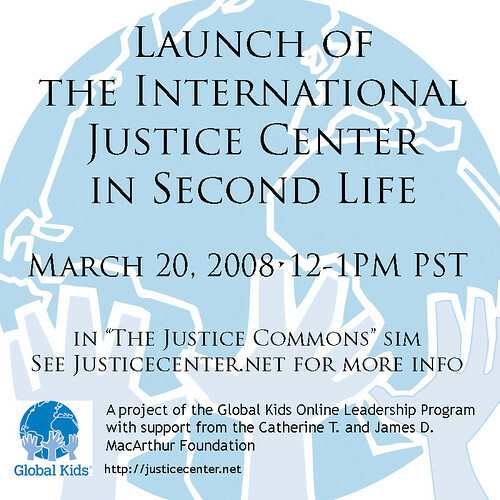 Based both on the web and in the virtual world of Second Life, the International Justice Center will host news, information and live events in support of the ICC. Today they will be hosting a series of events as part of our official launch, featuring an address by the Prosecutor of the International Criminal Court, Mr. Luis Moreno-Ocampo. After an introduction by Mr. Lloyd Axworthy, the former foreign minister of Canada, the prosecutor will appear “in-world” in avatar form to address the virtual audience, followed by a Question and Answer period. 3:00-4:00 PM EST: In-world remarks and Q&A with ICC prosecutor Luis Moreno-Ocampo. Mr. Lloyd Axworthy, former foreign minister of Canada, will introduce the Prosecutor. Via the Web: Click on this link to view on the web live. Via the Web: streamed video during the event. Via There.com: Sign up here and attend the event at the stage zone. Via Whyville: you can attend the event live in the Greek Theater. Another currency record. First time we break the 60k on a Saturday as well. 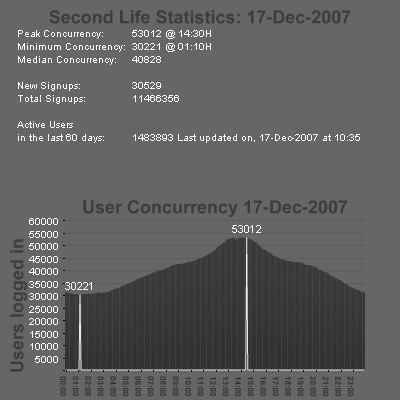 Peak concurrency grew 1,299 users, a increase of 2.18%. Minimum concurrency grew 983 users, a increase of 2.79%. 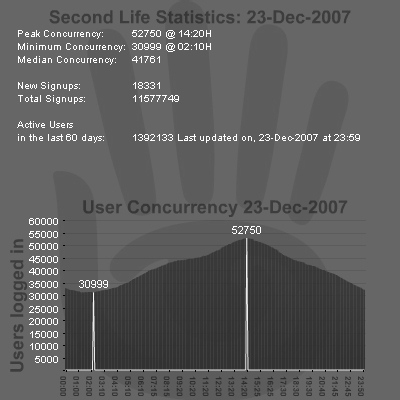 Median concurrency grew 1,043 users, a increase of 2.12%. Made some adjustments, been polling every minute now for the last few days instead of once every 5 minutes. This gives better results because depending on which server you hit you can get old data. As you can see I also added the SL logo as a background, what do you think, is that nice or to noisy? A local project tickled my interest, while nothing to do with SL, it is another step towards the virtual enhancing the real. To entice new students to their University, the Univeristy of Twente has created a virtual campus in a Habbo Hotel style. You can walk around with a avatar and click the buildings to get basic information about what they are dedicate too, find out at what bus schedule is, learn about their sport facilities, etc. My first reaction was why not using something like Google maps and overlay all that information, seeing the RL layout would be more useful. But considering the target demographic,16-18 year olds, it is understandable. They have grown up with virtual places like these. All these added things wouldn’t be as easily possible in a 2D map, but in a 3D world they invite you to explore more. And now if I ever would be there and a flat tire on my bike I would now know where to go to get a pump or where the campus market is to buy some supplies. If this would help people decide to go this University or not, i don’t know. I hope quality of the University will still be the determining factor. It is certainly a interesting way to learn in a playful way more about the campus you are about to spend your next 4+ years on. But it might also be a indication of how virtual worlds will enhance the way of providing information about real world places. Towns and Cities could do something similar and with some polishing and added community tool like myspace who knows what will happen.